Summary: The real Theresa May is very different from the image she would like to project. She is simply not someone who can be trusted on anything she says. She has an appalling record of saying one thing and simply not doing it or indeed doing the opposite. Labour need to shout this from the rooftops. Theresa May wants to be thought of as a strong and powerful leader, honest and dependable. Sadly she is not. She has changed her mind about waiting until 2020 for the next general election and claimed it is to give her a stable political environment in the UK to negotiate with Europe. In fact it is raw political expediency, capitalising on the woeful showing of Labour in the polls. She simply is not someone who can be trusted. Why should we believe anything she says? If Labour are to make headway against the Tories it is important that we make it clear how unreliable she is. She has broken many other promises already. When she was appointed PM she promised workers on company boards and a crackdown on executive pay. Promises that have evaporated. She also promised a Britain that works for everyone, yet the government has just introduced swingeing cuts to a wide range of benefits that affect many hard-working people. She says you are less likely to reach the top professions if you are state educated rather than educated privately. Yet she is now pushing grammar schools, long derided for being incompatible with enabling aspiration for all. She promised to increase spending on the NHS, social services and education. In fact they have had real cuts for several years which is why they are in such a dire condition. Twenty-four of her MPs are under investigation for fraud. It appears that they have been fiddling their expense returns at their election. No doubt they are all hoping those “oversights” will simply evaporate. 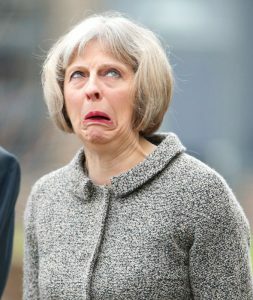 She promises to be tough on immigration even though in her seven years in the Home Office in charge of immigration she had no effect on it even though she could have used the standard EU regulations to manage it (see: http://outsidethebubble.net/2016/12/06/massive-negligence-by-theresa-may-when-home-secretary/). She claims to need a bigger majority to give her flexibility in negotiating with the EU. However she wants to write into stone the essential components of a very hard Brexit which, being part of the manifesto, would be become much harder for her to soften even if she wanted to. She has allowed the HMRC to agree sweetheart deals with large overseas companies and to be grossly negligent in not pursuing VAT cheats in the UK already identified by HMRC. She has consistently undermined the BBC and refused to support judges who went against her wishes on a point of law. She has conveniently postponed scrutiny of the Murdoch bid for Sky until after the election. No doubt this ensures a warm, fuzzy coverage for her campaign. She consistently misrepresents the British economy. She claims that “Since the referendum, economic growth has exceeded all expectations”. The reality is that GDP per head has grown much more slowly while the Tories have been in power than it did when Labour were in power. The UK has had the lowest GDP growth per head of any OECD country apart from Greece. Currently it is running at -1% per annum, a remarkable achievement for an economy she rates so highly. She is keen to abandon the Charter of Human Rights, the brainchild of Winston Churchill. This would put the UK into the same category as Russia, Saudi Arabia and South Africa, all enthusiastic deniers of human rights. She is refusing to appear in TV debates, expecting this to give her opponents the oxygen of publicity. She may feel she has the upper hand in parliament with her party braying behind her. However nobody would call her charismatic. In a more balanced studio environment she knows she will not do very well. The Conservative manifesto is increasingly being dictated by her and barely discussed in the Cabinet. She is using Lynton Crosby to decide what it should be and giving little thought to what might be better for the country. He is a man without scruples when it comes to manipulating how an election is managed.